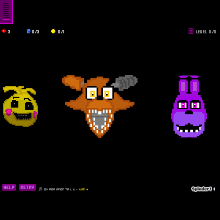 These are some of the characters from Five Nights at Freddy's. When you run out of power, Freddy will jumpscare you and kill you. Press the spacebar to see his jumpscare! But just so you know, this is not scary at all, so that's okay. I tried to make it scary.